Starting with the salad here, chef and sustainability advocate Dan Barber wants to change the way we eat. As the owner of a farm‑to‑table restaurant—actually a restaurant in the middle of a farm—I’ve gone on and on about local fruits and vegetables with no more apologies for repetition than a peanut vendor in a ballpark. Like most chefs, I can pick out the perfect heirloom tomato or the sweetest spring carrot. I’m a longtime advocate of the farm-to-table philosophy, but in the last decade I’ve come to see it as flawed, too—at least in the way we’re encouraged to uphold it. That’s because farm-to-table focuses on those singular tomatoes and carrots without considering the entire harvest. It’s a way of eating that is ecologically expensive; it also tends to ignore all that’s required to produce the most delicious food. I’ve spent the last 10 years writing The Third Plate: Field Notes on the Future of Food, drawing on the wisdom of innovative farmers, plant breeders and chefs around the world. What I realized in my research is that, for the future of good cooking, we need to look to where the recipe for flavor really begins. Start with the soil. Think of it as a bank. Harvest a crop and you’re borrowing nutrients from the bank. Pretty soon you need to pay back the loan. Sir Albert Howard, the British scientist and father of organic agriculture, called this the Law of Return, the word law suggesting—rightly, it turns out—that it’s nonnegotiable. Unless farmers return fertility to the land, soils suffer. Restoring fertility is the key to soil health, which means it’s key for flavor as well. So how do farmers do this? The best ones use manures or composts. And they don’t just grow one thing. (After all, a 1,000-acre monoculture has never sustained the soil, or produced anything good to eat.) Instead, they create intricate rotations of grains, legumes, vegetables and animals, each designed to keep the soil’s nutrient balance in the black. But what if paying back the bank also included changing how we think about dinner? What if we could create a meal, or even a pattern of everyday eating, that helped enforce Howard’s law? In other words, what if we—you, me and everyone else who eats—began thinking of that dictate less as an abstract idea and more as a recipe? One way to do this is to redefine what we covet for dinner. We need to stop privileging ingredients that take so much from the soil—those tomatoes, those carrots—and champion a whole set of interrelated and often overlooked crops that feed the land, too. You’ve heard of a nose-to-tail approach to the pig? This is a nose-to-tail approach to the whole farm. To honor every part of the harvest, Dan Barber created a salad plate with four categories of food. Barber is a big fan of rye berries, not just because of their toasty flavor but also because rye—like barley—is a fast-growing crop that suppresses weeds and pests and adds a carbon boost to the soil. Sprouting the rye softens the grains and makes their nutrients easier for the body to absorb. A simple way to serve the sprouted rye berries is to toss them with a light shallot vinaigrette. “Everyone should be eating more beans,” says Barber. They are miracle workers on a farm because they grab nitrogen from the atmosphere and store it in their roots, thus replenishing the soil. “Peas and peanuts perform this neat trick as well,” Barber adds. For his pea-and-bean salad, he mixes in toasted peanuts and three kinds of seed to add crunch. Like cabbage, broccoli, brussels sprouts and kale, turnips are members of the Brassica family. They’re valuable on farms because they help fight harmful bacteria and weeds in the soil. Barber likes to serve his turnips in the summer, when they’re surprisingly sweet. He doesn’t throw out the leaves; instead, he uses them to make a lively, all-purpose salsa verde with mixed herbs, mashed anchovies and lemon. Animal Protein Drawing inspiration from organic agriculture pioneer Sir Albert Howard—who said, “Mother Earth never attempts to farm without livestock”—Barber likes to add animal protein to his dishes. Here, it takes the form of a wonderful homemade ricotta. Using buttermilk as well as whole milk makes the creamy cheese slightly tangy; it’s terrific with salads or spread on toast with a little honey. Barber even uses the leftover whey to braise onions. Dan Barber created the following four recipes to be served together, although each one is extremely versatile on its own. 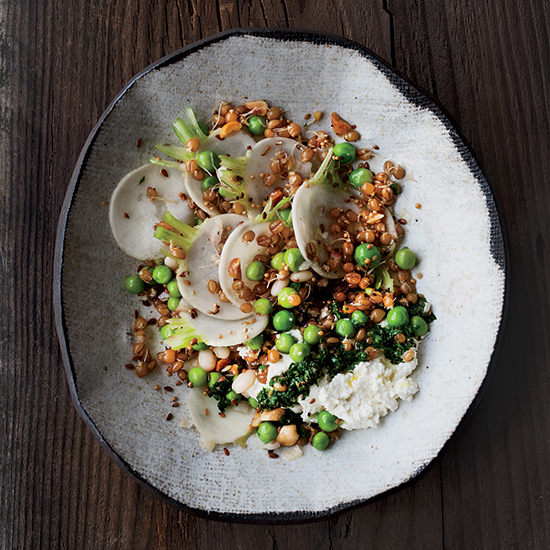 To compose the dish in the photo, divide the two salads among eight plates, add a dollop of ricotta, and garnish with the salsa verde and sliced turnips.